When the holidays approach, it’s the perfect time to up your game in the kitchen with standout recipes. A knockout holiday meal starts with a main dish like filet mignon topped with Roasted Garlic Compound Butter for a rich treat, paired with cheesy a sidekick like these Crispy Cheddar Mashed Potato Puffs. Finally, top off the night with Honey and Blackberry Cheesecake with Gingersnap Crust, and you’ll have guests ready to come back next year. It’s easy to add buttery richness to just about any protein you choose to serve at your holiday gathering with this easy compound butter. The sauce takes little time to make and adds an unforgettably elegant touch to filet mignon, making it perfect for your next holiday celebration. 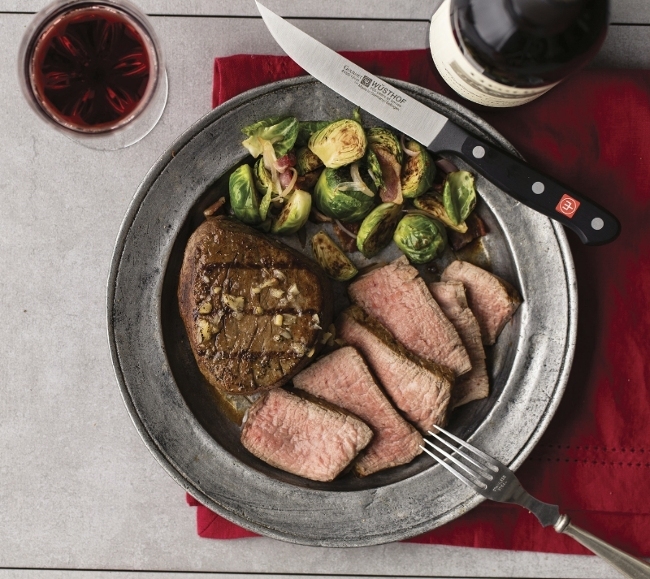 Cut from the heart of the tenderloin, Omaha Steaks Filet Mignon is aged to peak flavor and tenderness, vacuum wrapped and flash frozen to lock in freshness. Find more holiday main dish ideas and recipes at omahasteaks.com. Transforming family recipes into something memorable is easy when you use high-quality, wholesome ingredients, made with love from Borden Cheese. With a wide range of offerings, including mild cheddar, mozzarella, sharp cheddar, Mexican, Swiss, American, Colby Jack and more, Borden Cheese is available as singles, shreds, chunks, slices, strings and snacks – offering pure, creamy goodness to satisfy every taste. Add a new twist to your holiday spread with this delectable recipe for Crispy Cheddar Mashed Potato Puffs, which uses chunks of mild cheddar, and find more recipes at BordenCheese.com. Once the satisfaction of a full meal wears off and the craving for one final course comes calling, there’s no better dessert to turn to than the creamy delight of cheesecake. Add in the sweet flavors of honey and blackberries, and you’ll find yourself perfectly content to wind down the holiday get-together. For more ways to infuse honey into your holiday menu, visit honey.com.